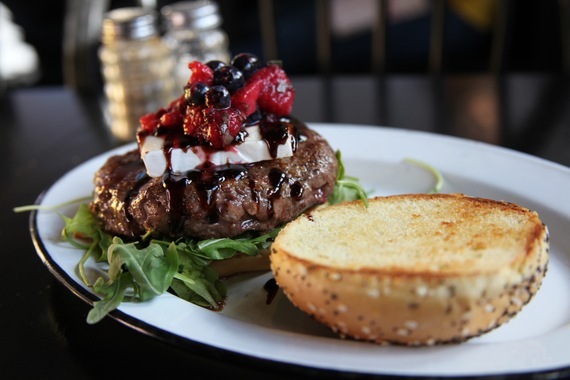 The perfect combination of sweet and savory, Grange Hall's Berries and Brie Burger is made from Tallgrass Beef Company's grass-fed beef, topped with brie, arugula, mixed berry compote, Dijon aioli and a red wine balsamic reduction, served with either a sesame seed or gluten-free bun or on a bed of lettuce. 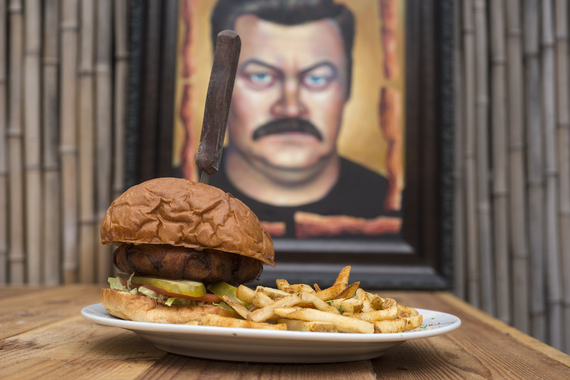 Bacon lovers rejoice at WHISK over The Ron Swanson, an 8oz burger wrapped in 1lb of bacon, topped with bacon-mayo and served with a side of regular or Cajun fries. 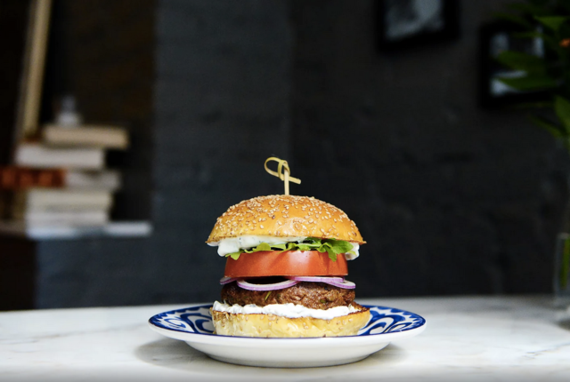 A departure from the classic beef patty, Amali serves up its Spiced Lamb Burger with tzatziki, red onion and arugula on a sesame brioche. 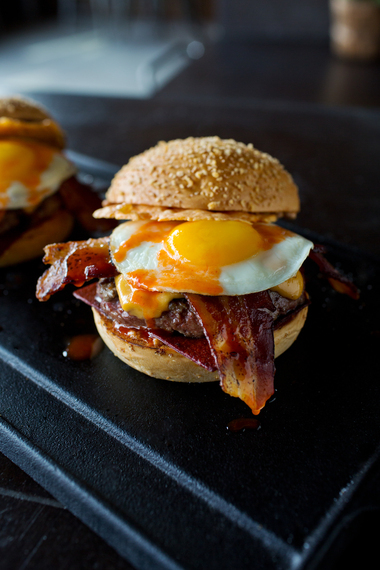 The Chef's Favorite Burger at Plan Check is made with cheese two ways, bacon two ways, a sunny fried egg, hot sauce and ketchup leather -- a mysterious, innovative take on the favorite condiment that'll have you smiling all the way home. 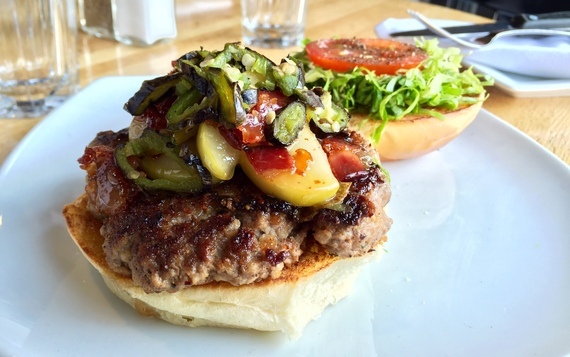 A.bar delivers a juicy patty with Lancaster Swiss -- a creamy cheese that's full of flavor -- pickles and bacon-onion jam. Photo provided by One Market. 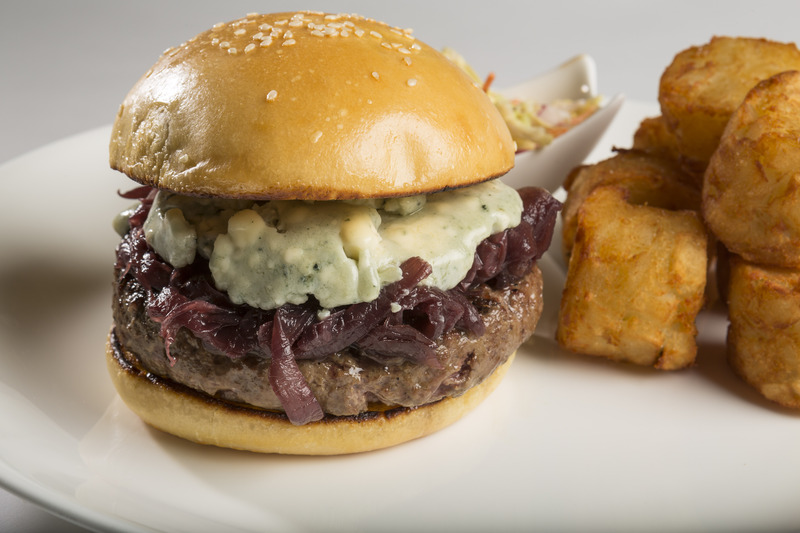 One Market's Hamburger and Potato Tots, prepared with sweet onions, coleslaw, port Dijon and Point Reyes blue cheese -- the Best Cheese/Dairy Product at the Fancy Food Show in Washington D.C. -- is the epitome of a power lunch. Photo provided by DB Bistro Moderne. 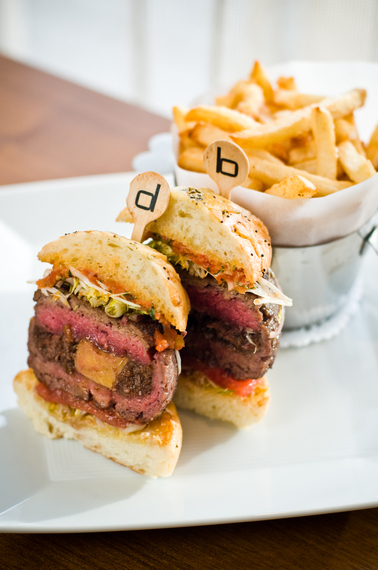 Not likely to be found at your backyard barbecue, The Original DB Burger is filled with braised short ribs, foie gras and black truffle, and served on a Parmesan bun with a side of pommes frites. 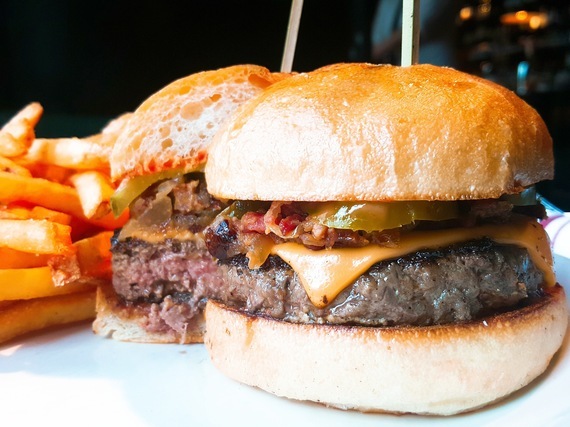 As its namesake suggests, Burger & Barrel delivers best-in-class burgers, including the award-winning Bash Style, prepared with onion and bacon jam, pickles, American cheese and special sauce. 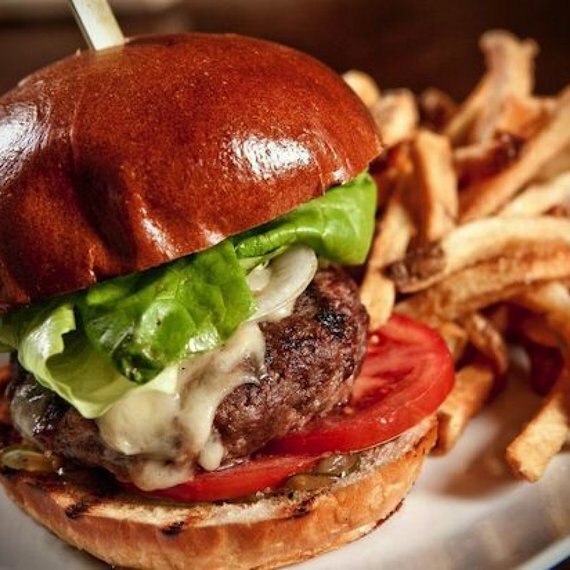 A delicious lunch to cozy up to with a craft cocktail, the signature burger at Trade boasts rustic vibes with pancetta, Vermont cheddar and grilled onion. 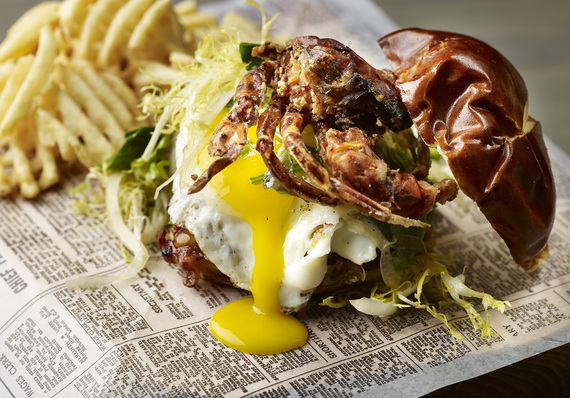 A perfect complement to the microbrews from Abigaile's on-premise brewery, the Dry Aged Brewery Burger oozes with Gruyere and truffle aioli and is topped with arugula, heirloom tomato, caramelized onion and an optional fried egg or slab bacon. 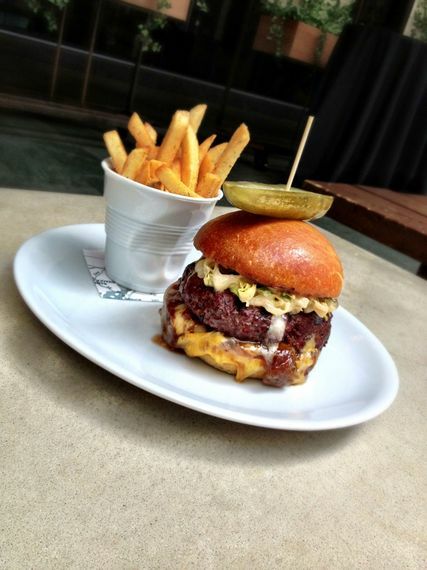 Made with crispy pork belly and white cheddar and served with herb fries, the "Le Royale" burger at RN74 is an extra juicy lunchtime treat that's sure to fuel your afternoon. On its upscale pub-grub menu, The Tip Tap Room features a number of inventive burgers, including turkey with cranberry, steak with a veal demi-glace and Italian sausage with pretzel-Dijon mustard, to pair with its 36 different draft beers. Photo provided by Village Whiskey. 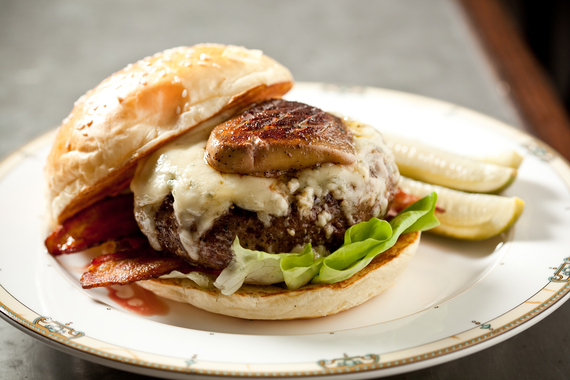 Made with sustainable, farm-raised Angus beef from Maine, the Whiskey King at Village Whiskey will knock your socks off, topped with maple bourbon-glazed cipollini onions, Rogue bleu cheese, applewood bacon and foie gras. 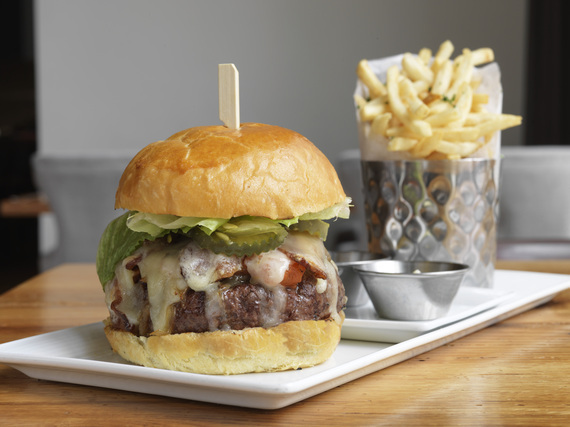 Offering the best of both worlds, the Surf & Turf Burger at The Franklin Room -- ⅓ lb. Wagyu beef, soft shell crab, whiskey-balsamic sauce, fried egg, cheddar, provolone and bacon on a pretzel bun alongside waffle fries -- satisfies all your cravings. Photo provided by Darren's Restaurant. 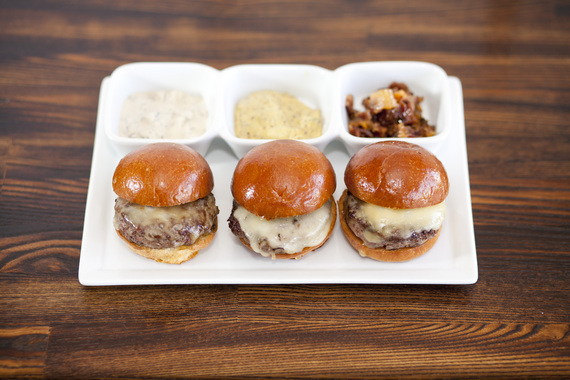 Darren's Grass Fed Burger Sliders -- three sliders with bacon, red onion jam, in-house smoky chipotle Velveeta cheese, sun-dried tomato remoulade and brioche buns -- is one of many mouth-watering snacks and small plates great for sharing with friends. 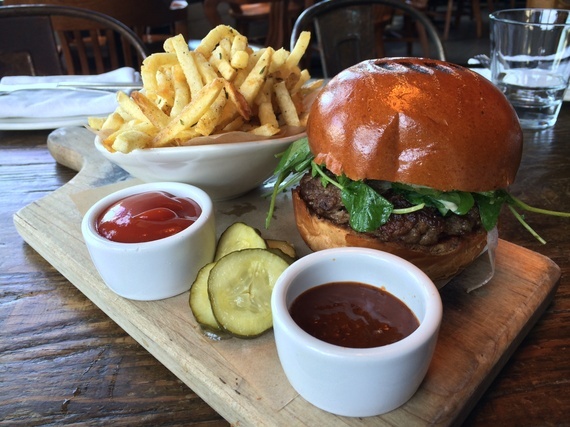 A can't-miss for condiment lovers, Catalyst's house burger is served on a brioche bun with cheddar, bacon, caramelized onions, roasted tomato, house-made ketchup, mustard and aioli, plus a side of Catalyst Fries. Looking for something lighter? 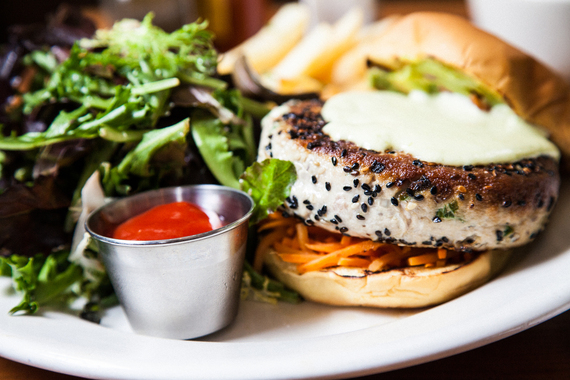 Ditch Plains' Sesame Crusted Tuna Burger with pickled carrots, guacamole and jalapeño aioli is a match made in heaven.